P1: Many of the most damaging and life-threatening types of weather-torrential rains, severe thunderstorms, and tornadoes-begin quickly, strike suddenly, and dissipate rapidly, devastating small regions while leaving neighboring areas untouched. One such event, a tornado, struck the northeastern section of Edmonton, Alberta, in July 1987.
than they do forecasting specific local events. such a network were insurmountable. Fortunately, scientific and technological advances have overcome most of these problems. Radar systems, automated weather instruments, and satellites are all capable of making detailed, nearly continuous observation over large regions at a relatively low cost. Communications satellites can transmit data around the world cheaply and instantaneously, and modern computers can quickly compile and analyzing this large volume of weather information. Meteorologists and computer scientists now work together to design computer programs and video equipment capable of transforming raw weather data into words, symbols, and vivid graphic displays that forecasters can interpret easily and quickly. As meteorologists have begun using these new technologies in weather forecasting offices, Nowcasting is becoming a reality. 2. Why does the author mention the tornado in Edmonton, Canada? 4. Why does the author state in paragraph 1 that observations are taken “just once every twelve hours“? 6. Which of the following is NOT mentioned as an advance in short-range weather forecasting? 10. With which of the following statements is the author most likely to agree? (A) Communications satellites can predict severe weather. (B) Meteorologists should standardize computer programs. (C) The observation-intensive approach is no longer useful. (D) Weather predictions are becoming more accurate. 11. Which of the following would best illustrate Nowcasting? (B) A warning about a severe thunderstorm on the radio. Live in hurry or live at a slow pace, which one do you prefer? Hello! 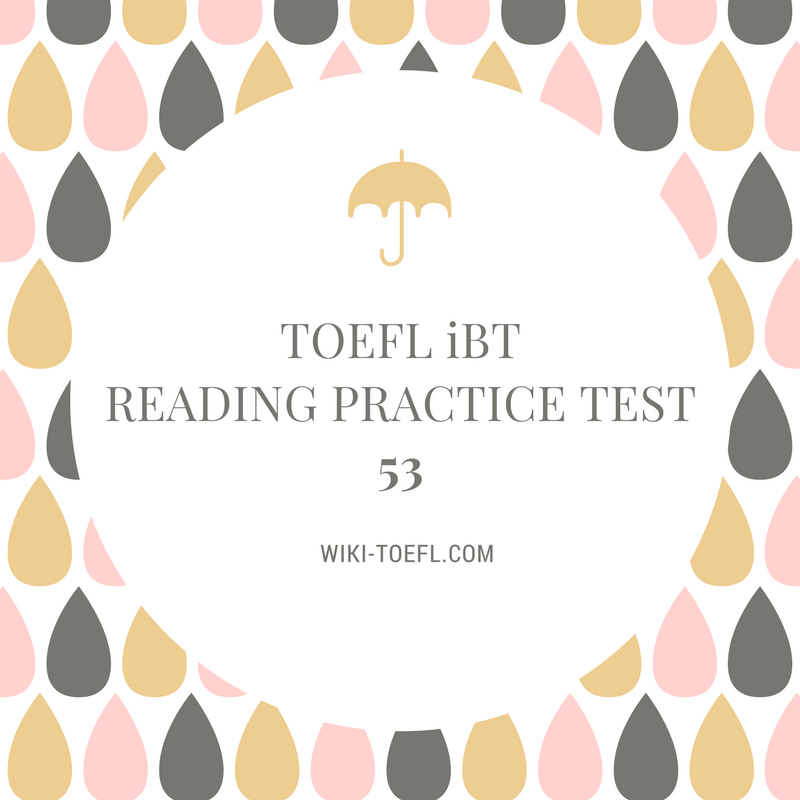 Please send me the reading practice 53 answer keys. My email address is [email protected]. Thank you very much. Hi Kanha, I will update Solution & Explanation for TOEFL Reading Practice Test Daily from test 01 to test 75. Now is Reading Practice Test 2:https://wiki-study.com/toefl-ibt-reading-practice-test-02-solution/ . Please wait and follow my webiste to receive the Latest Reading Solution. I will update Solution & Explanation for TOEFL Reading Practice Test Daily from test 01 to test 75. Now is Reading Practice Test 2, you can find here: https://wiki-study.com/toefl-ibt-reading-practice-test-02-solution/. Please wait and follow my blog to receive the Latest Reading Solution.